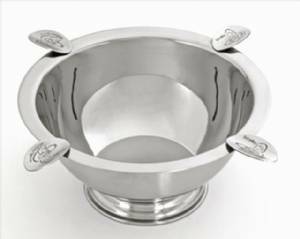 Stinky 4 Stirrup Stainless Steel Ashtray Discounts Apply ! The "Stinky" line of products are here at Heartfelt. The NEW 4 Stirrup "Stinky" ashtray is in my opinion the best ashtray to use when enjoying cigars. The "Stinky" ashtray was specifically designed by Stinky to fit the needs of cigar smokers. The bowl is extra large so that it can handle the large amount of ash and snubbed cigars that can be generated, especially when your are enjoying a HERF with friends. Dimensions: 8" in diameter and stands 4" tall.